It is the little things that make the biggest difference. The how-to’s and simple solutions. And it’s the big things that make a difference, too. New skills and new friends. 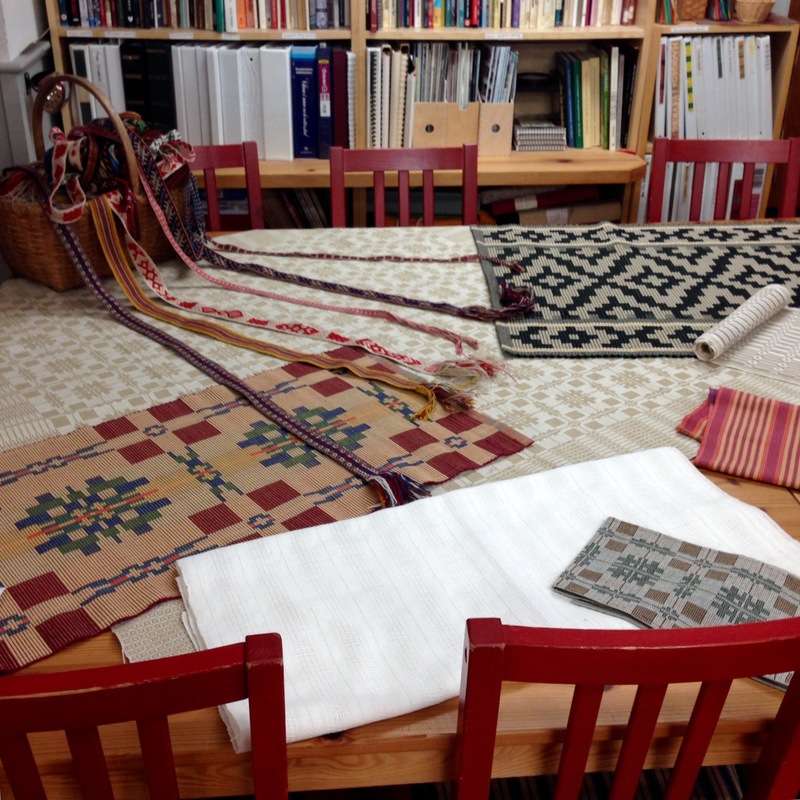 I am having a delightful time at Vävstuga Weaving School this week, learning and practicing. 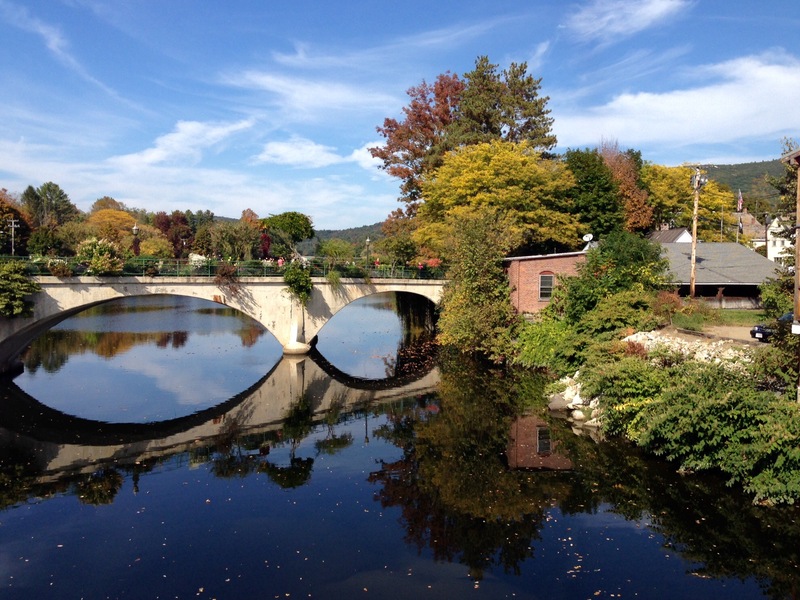 It’s a bonus that I get to be here in Shelburne Falls, Massachusetts at such a beautiful time of year. 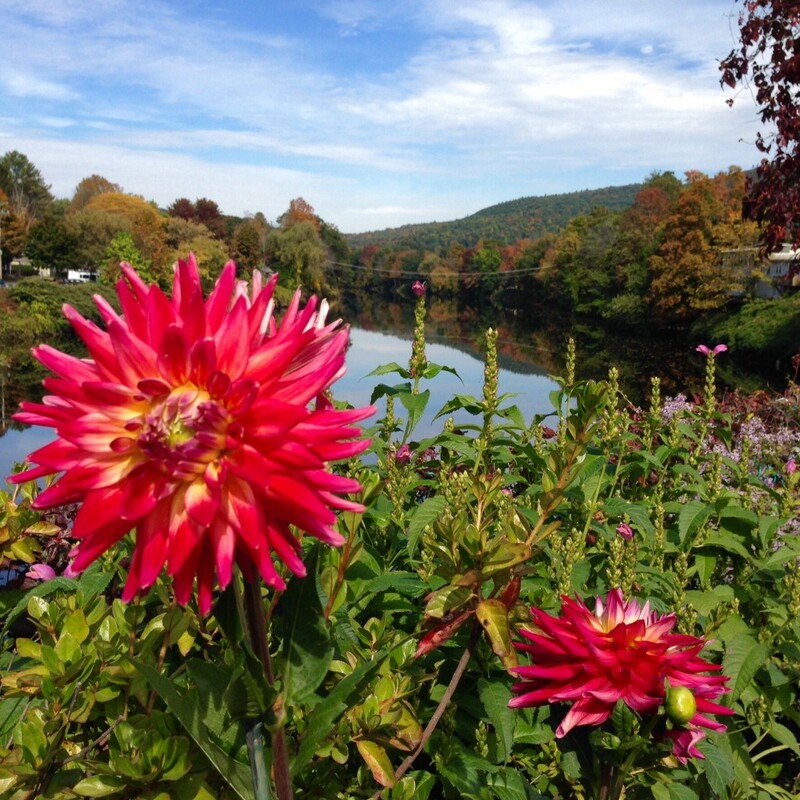 May you witness beauty all around you. So beautiful. Will be thinking of you. Leaving for Savannah on Wednesday morning. Not the same as autumn in New England. Hi to Becky and the group. Cyndi, it is beautiful here! I will Becky and the others that you said Hi. It’s so exciting that you have this wonderful opportunity. And, at this time of year you’ll get to enjoy beauty inside and out! 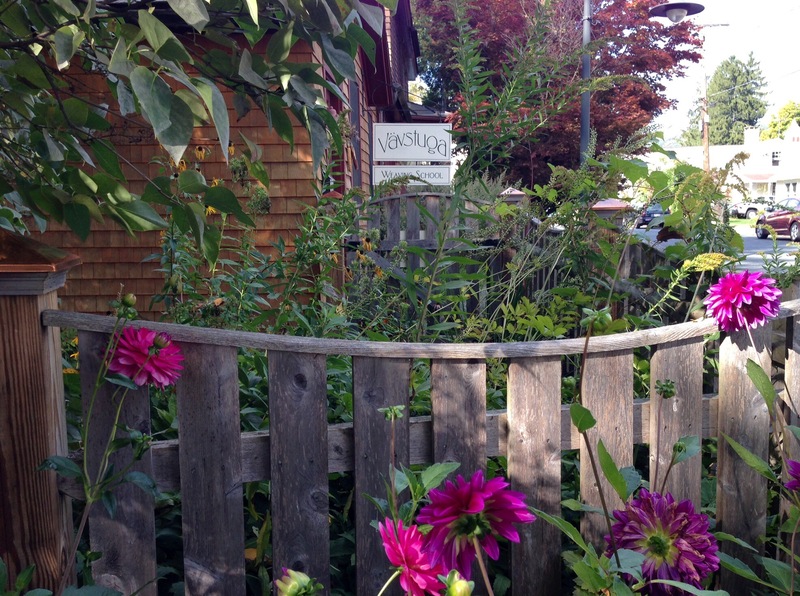 Thank you for sharing your pictures of your visit! Hi Karen, just wait till you see what we have been weaving! If you are a weaver, you know this thrill. 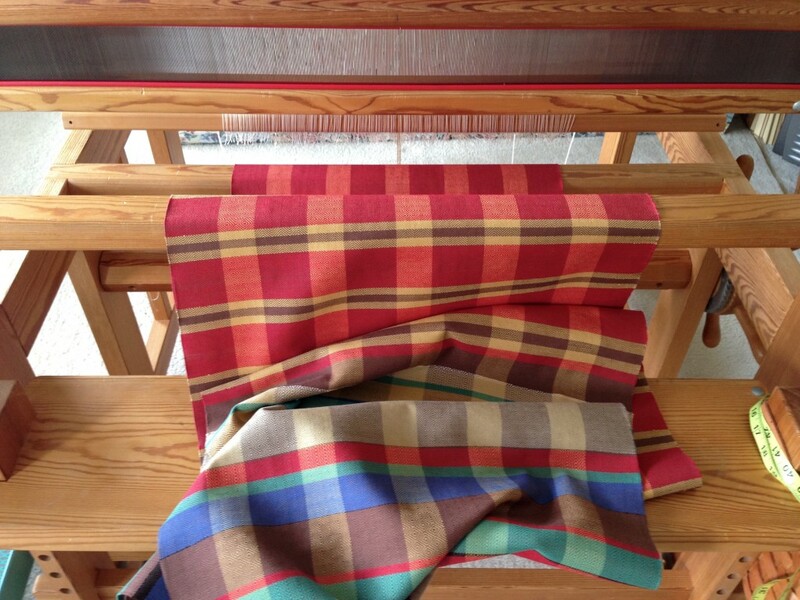 I weave the very last pick, and then I hold my breath as the finished cloth is unrolled from the cloth beam. All ten meters / eleven yards of it! I don’t usually have an audience for the unrolling, but this time I want to share the experience with you, my friends. 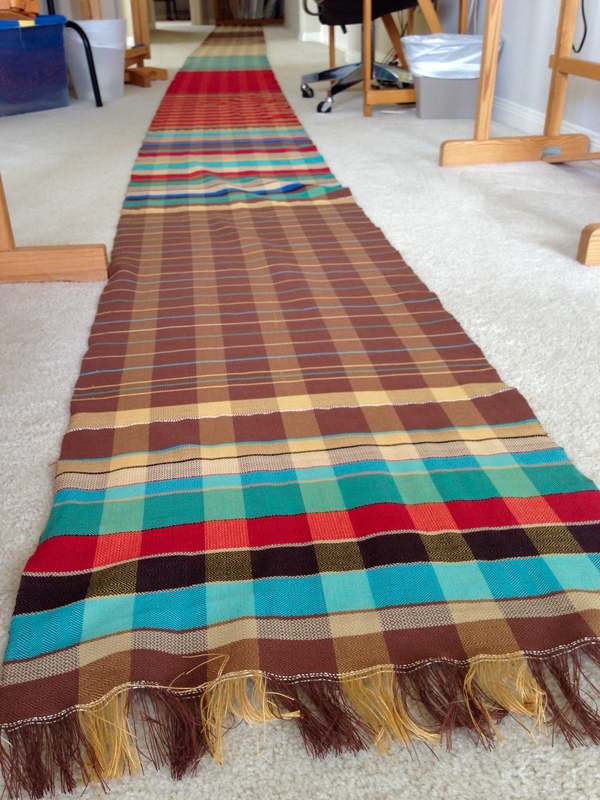 If you stay to the end, you will see the cap I made from the sample pieces at the beginning and end of the warp. And, one more thing, I added a little 3 1/2-minute time-lapse video at the very end. I hope it makes you smile. Release ratchets on cloth and warp beams to loosen warp tension. Get out the big Gingher shears and start cutting. Seeing brown now, so we know we are getting near the end/beginning. Finally, we made it to the tie-on bar! 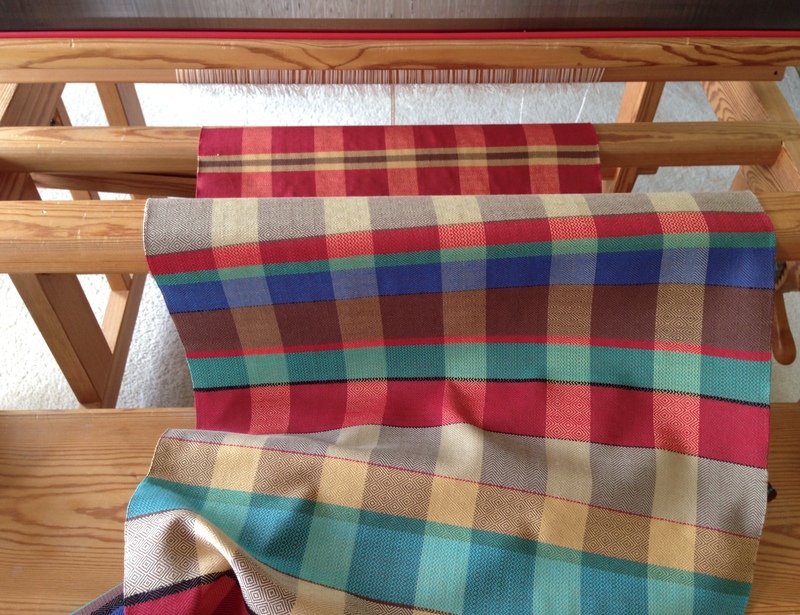 I love the final sound–warping slats falling to the floor as the last round of cloth is pulled from the cloth beam. There it is. 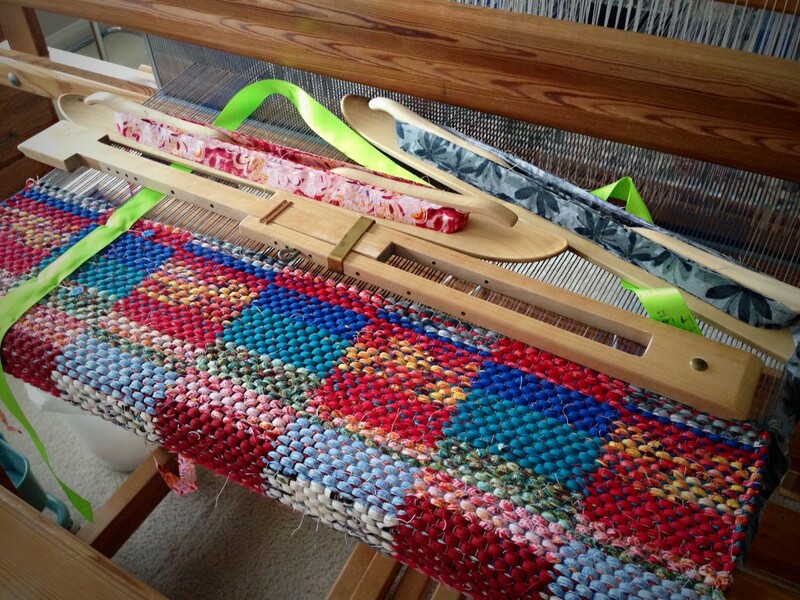 Now I want to get something else on the loom so I can do this all over again! And now I invite you to join me as I weave the Nine Color Towel. 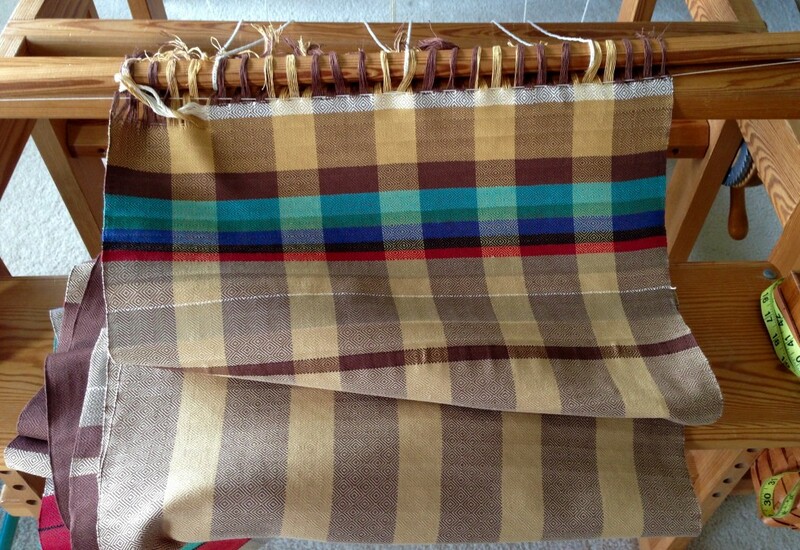 Remember that this is time lapse–I really do not weave this fast. May you be filled with joy. 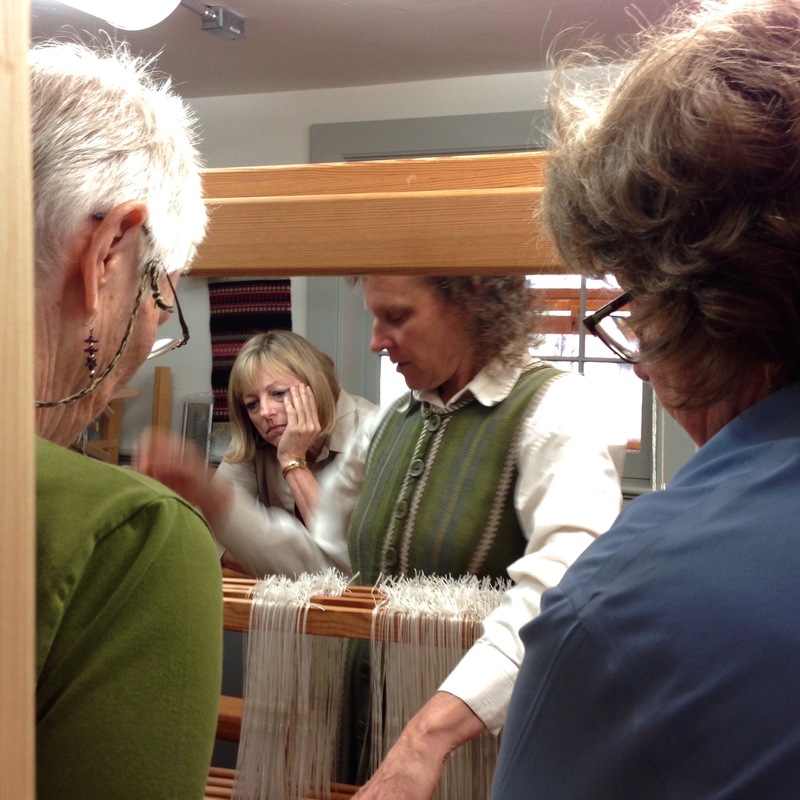 Have you ever experienced tendonitis from weaving? I’m curious about how you hold your shuttle and throw with your right hand- I can’t tell in the video. I have thumb tendonitis and haven’t been able to weave for several months. Any suggestions? Thanks! 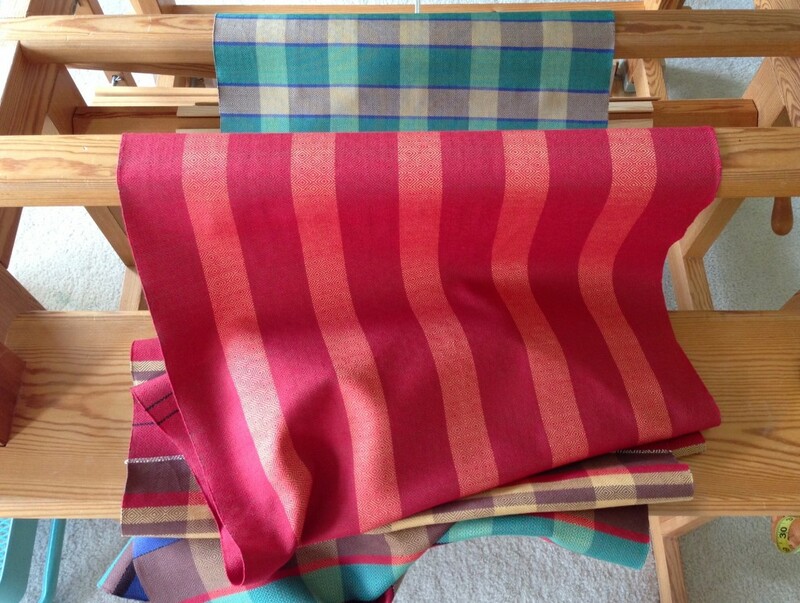 Claudia, I have never experienced tendonitis from weaving. I’m so sorry you have to endure that. I always hold my shuttle with my palm up – to throw the shuttle and to catch it. Joanne Hall taught me, “thumbs up.” I think that may be more friendly to the hands and wrists than grasping the shuttle with thumbs down. Thanks so much Karen – very helpful. I enjoy your blog so much and appreciate you getting back to me. 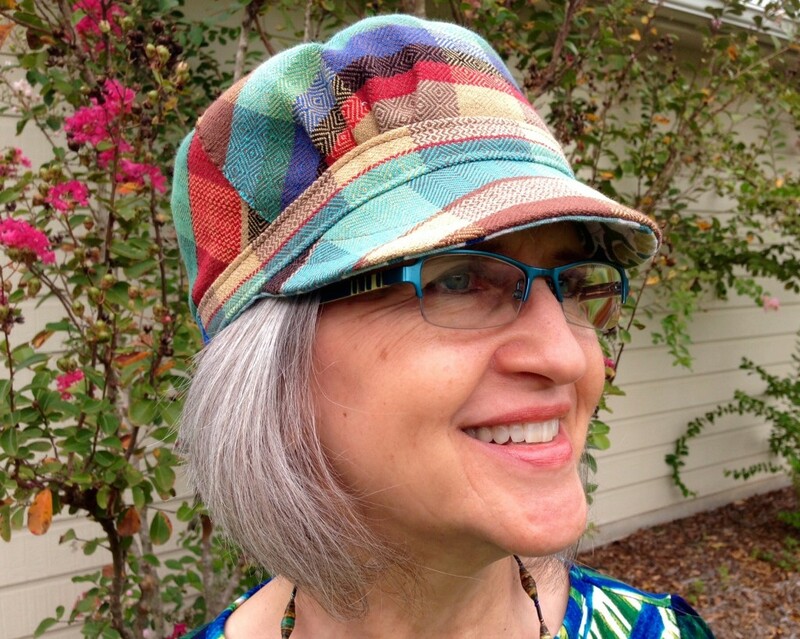 Gorgeous fabric and your hat is adorable!!! Did you have a pattern for the hat? Mary, I used a McCall’s sewing pattern for the hat. I made one first out of fabric from the store to make sure it was a good fit. So, now I have two new hats that are fun to wear. Thanks for the compliment. I’m glad you like the fabric! What Beautiful Towels! I love that you’re chomping at the bit to get another batch going. I watched your video twice! How nice to be able to watch your process at the loom. You have a lovely work room. I love that big Glimakra shuttle. I also admired your bobbin winder. Didn’t your husband make that for you? I love how much he supports with your love of weaving. Good man. Thanks, Laurie! It’s that much more fun when friends enjoy it with me! Yes, my husband made the bobbin winder. He’s my go-to guy for nifty tools. I appreciate your enthusiastic comments! Moving the temple out of the way gives full view of the rug in progress. Blocks of color in this double binding weave hint at quilt blocks. We count on the sun rising and setting every day. So, why do we worry? We tell ourselves there is not enough time, the day is too short. We can’t seem to make ends meet (did a weaver make up that phrase?). The one who positioned the sun knows how time works. And, surely, our Maker knows how to make our ends meet. Most people worry. But you do not have to worry. Your heavenly Father knows precisely what you need. He is glad to provide for you from his kingdom resources. When I weave an imagined sunset into a handcrafted rug, it is a simple replica. When we see the actual display of sunset colors in the sky, let it be a reminder to put our trust in the One who is weaving our story. Those pesky warp ends! I am getting loose warp ends on the outer edges again. The last time this happened, it was near the end of the warp, and I rigged up a makeshift solution. (You can read about it and see pictures HERE.) This time, I began having trouble from the start; so, when I finished weaving the first piece, I cut it off, and re-tied the warp. There must be a better way! Dice weave in linen. First piece is cut from the loom; and warp ends are re-tied. 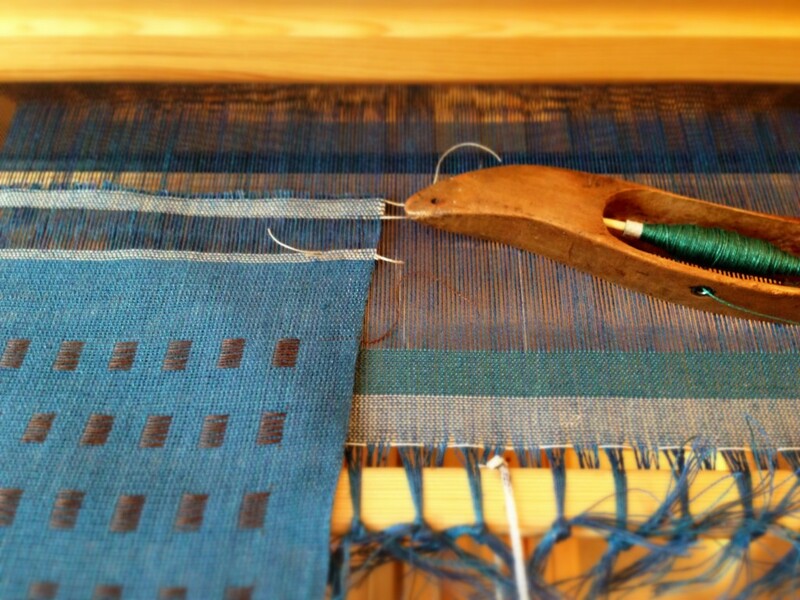 Emerald green weft for the second piece produces a lovely teal with the deep blue warp. How do you handle recurring problems? I get tired of stumbling over the same old thing. I wanted to find a solution to this warp issue, so I started digging through my weaving books to see what I could find. Aha! On page 254 in The Big Book of Weaving, by Laila Lundell, I find helpful advice. This can be adjusted by pressing an extra slat down at an angle inside the loose sections. One more secret in the bag of tricks to manage uneven warp tension. Simply insert extra warping slats into the warp against the warp beam. Thank you, Laila! Seekers find secrets. The seeking itself shows you recognize your own need. This is what prayer is about. Come to God asking, seeking, knocking. These are the prayers he answers. Simple, heartfelt, persistent. Never give up. There are secrets to be found. May you uncover long lost secrets. Am I surprised you found your weaving answer in the Big Book of Weaving???? And you are right, prayer answers so many other problems. Getting excited about your trip? Cyndi, you know me well. The Big Book of Weaving is my favorite resource. Yes, I’m very excited about returning to Vavstuga in a couple weeks! That means more secrets to put in my bag of tricks. What an encouragement and reminder that God is pleased when we come to Him with our ‘tensions’ of life. He is the great healer and provider. So thankful we can commune with Him through the Bible and prayer. The Big Book of Weaving ist my favorite too. I learned to weave with it ! 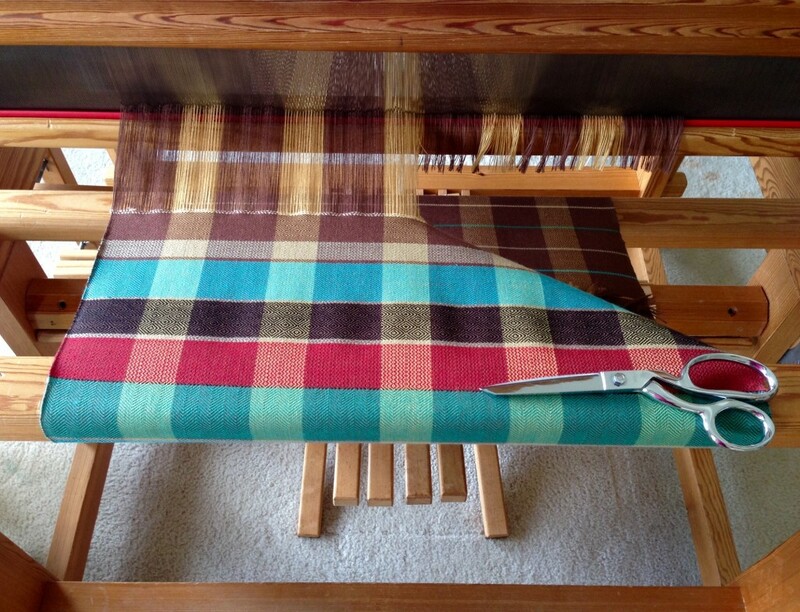 There are many secrets in weaving. 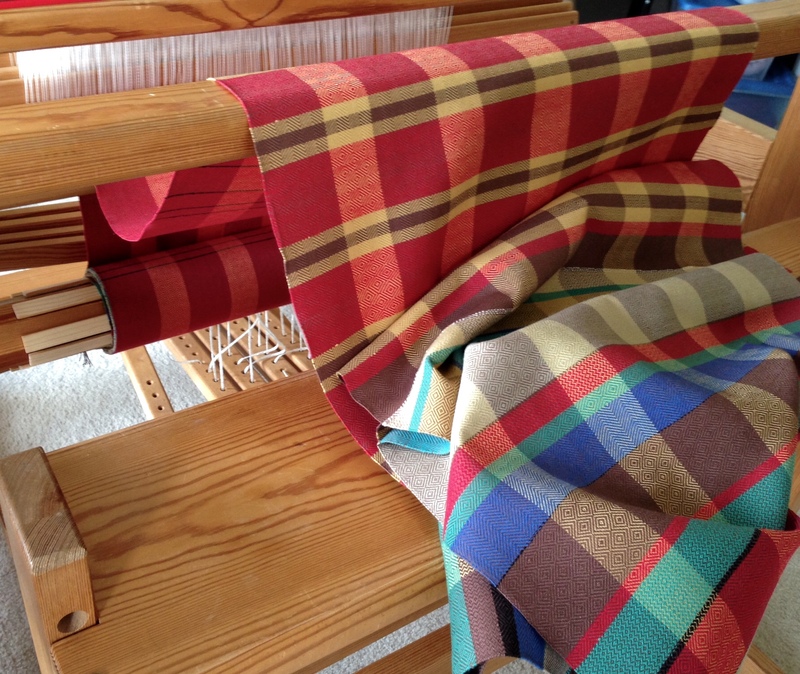 Heard a professor talking about it yesterday – here on the handweaving fair in Umeå. Marianne, I am delighted to read your comment. It is very special to receive greetings from Sweden! I am using The Big Book of Weaving as my own textbook to teach myself how to weave. I enjoy learning from it. I have some Bockens 16/2 linen and have been staring at the dice weave picture in The Big Book of Weaving, wondering if the floats on the back are too long in the pattern sections. 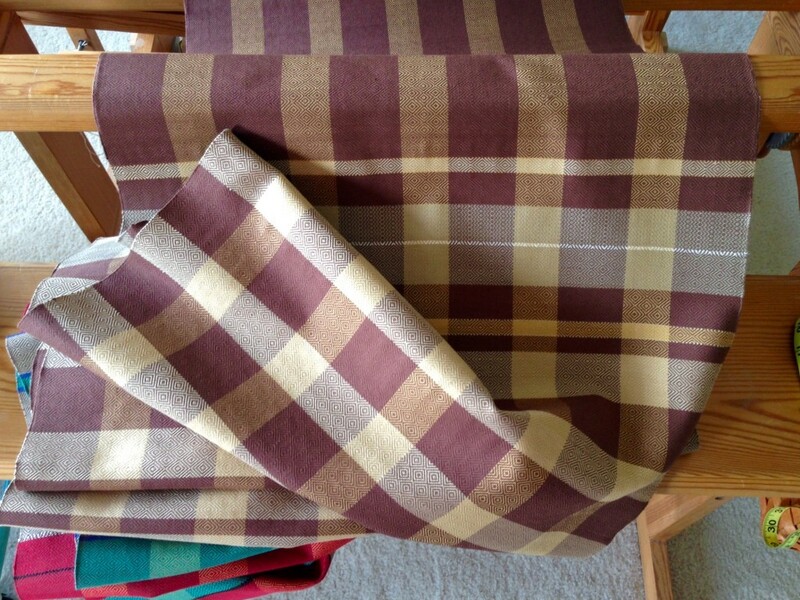 I wanted to make a table runner, not a pillow in which they would be protected on the inside. What were you using your beautiful blue dice weave piece for, and what do you think about the floats on the back? 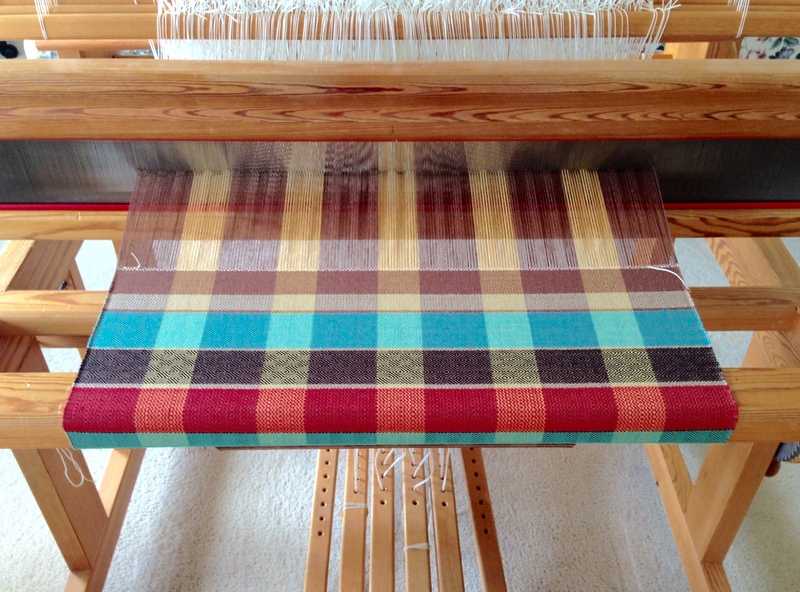 Few things are as important as even warp tension if you are hoping for quality results in your weaving. 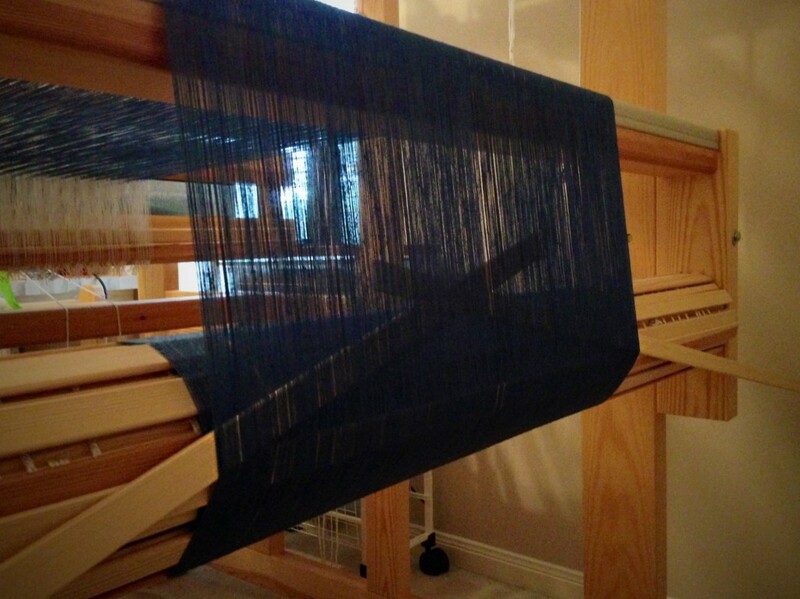 Eight warping slats are placed, one by one, across the warp as I begin beaming the warp onto the octagonal warp beam. 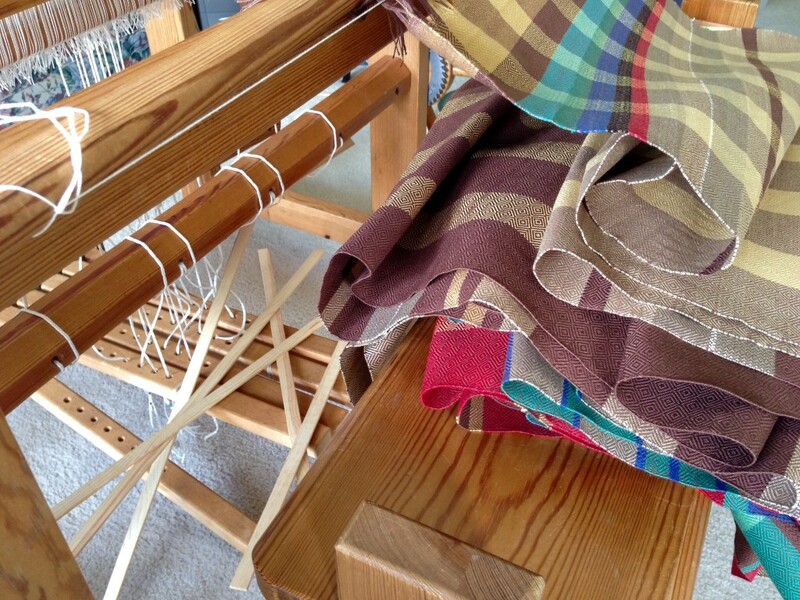 After three full revolutions, I do it again, with eight more slats; and repeat the process until the warp is fully beamed. 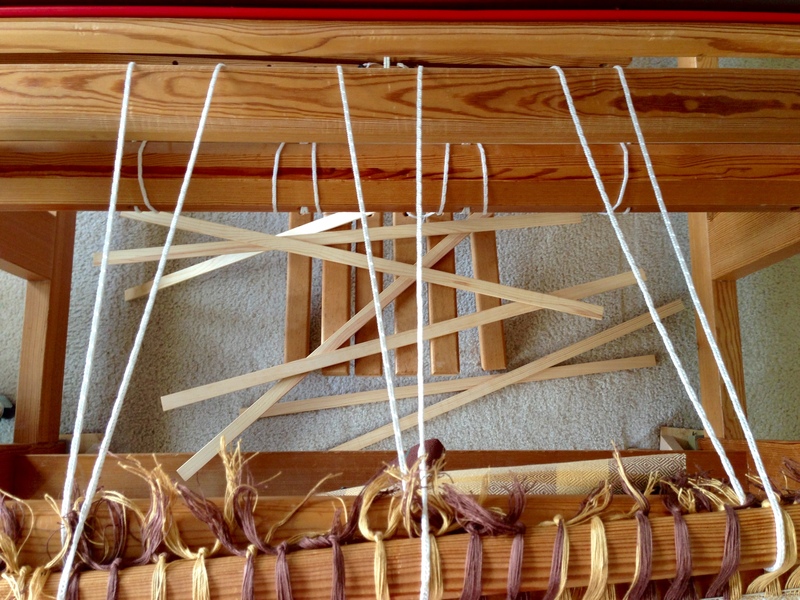 This effective technique gives a solid “platform” every few rounds for the warp ends, promoting even tension across the warp. 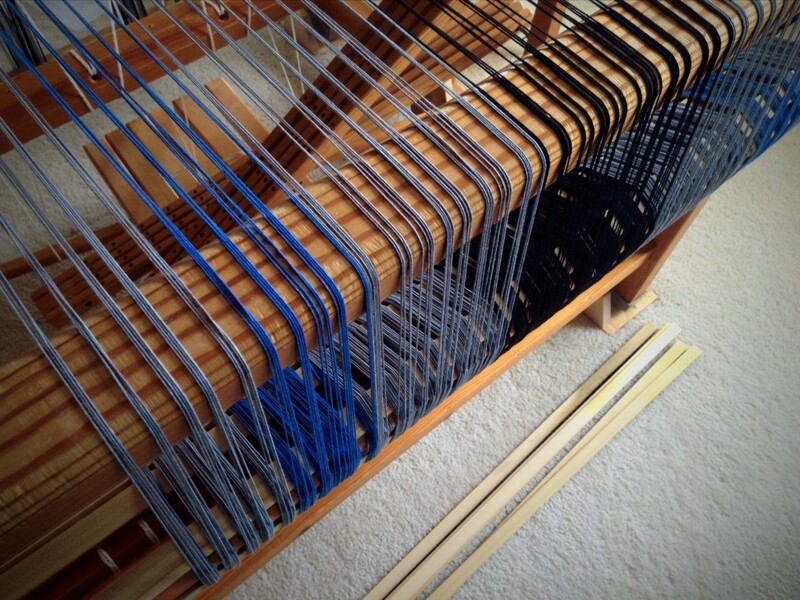 Warping slats lay in a pile behind the warp beam. Counting out eight slats at a time helps me know when I have covered the eight sides of the octagonal warp beam. The warping slats are hidden between the layers of warp ends. 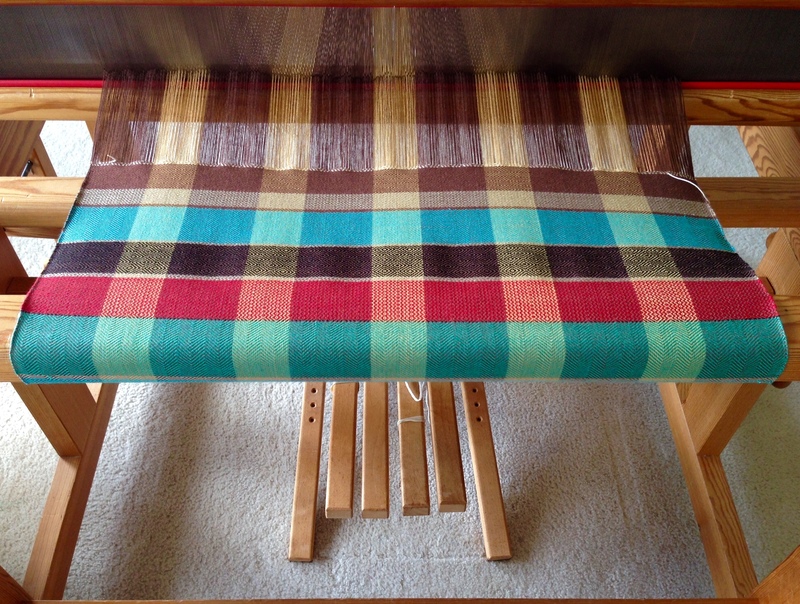 Having the slats in place means I can confidently tighten this rug warp to the max, giving me the best conditions for a handwoven rug. Nothing is hidden that will not become evident. In other words, when I tighten my warp I can tell without looking that the slats are in place. 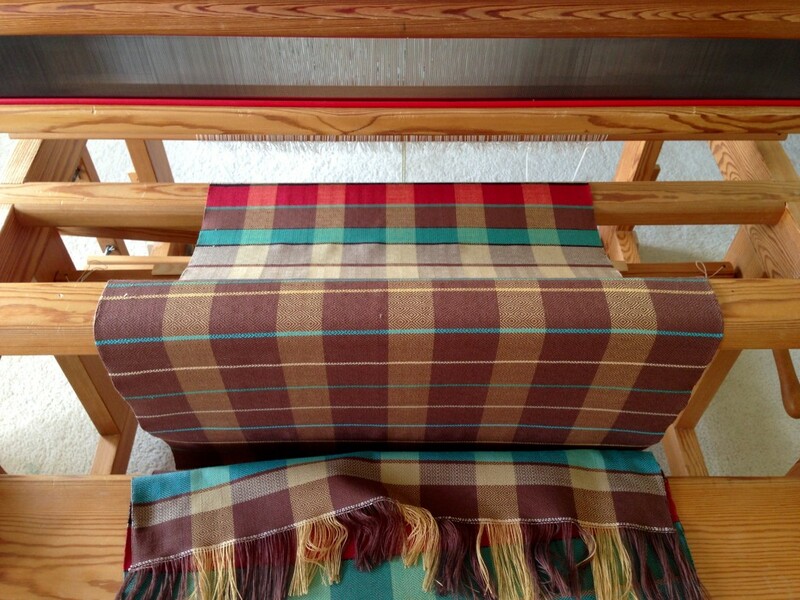 And better than that, the rugs that are produced will have the consistency that a tight, even warp provides. The warping slats are like faith. Faith hidden in your heart becomes light that is seen in your life. How you live is evidence of what is in your heart. Faith always bears evidence.